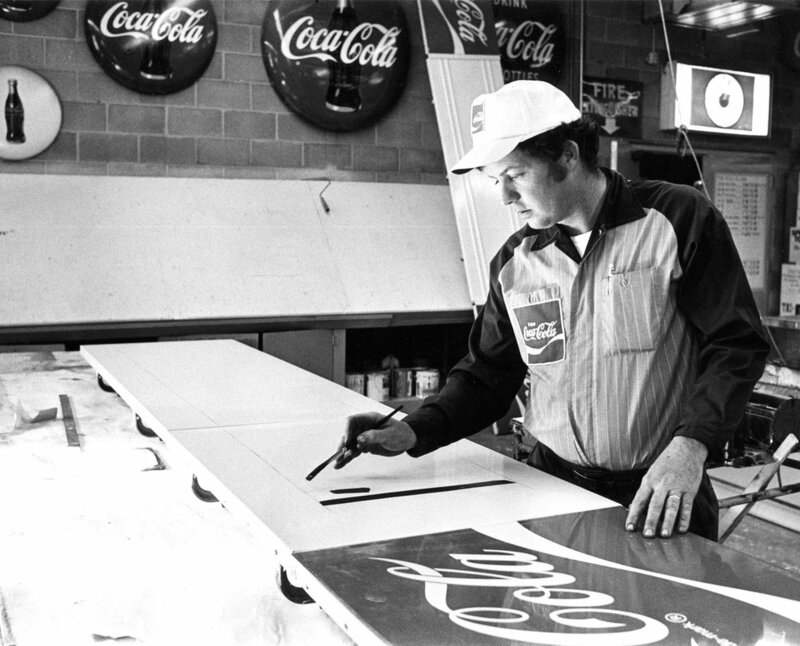 Painting signs for Coca-Cola Consolidated was the only job Andy Thompson ever had. Now, as faded “ghost signs” of the company’s past are restored, his granddaughter carries on a family tradition. Painting signs for Coca-Cola Consolidated was the only job Andy Thompson ever had. Now, with a passion to resurrect the faded “ghost signs” of the company’s past, Andy’s granddaughter, Amber, is ready to carry on a family tradition. Additional photos provided by Amber Thompson and Coca-Cola Consolidated. Amber Thompson walked up to the brightly painted Coca-Cola sign on the side of a former barbershop in Cherryville, North Carolina. She took a deep breath and a quiet moment to compose herself. 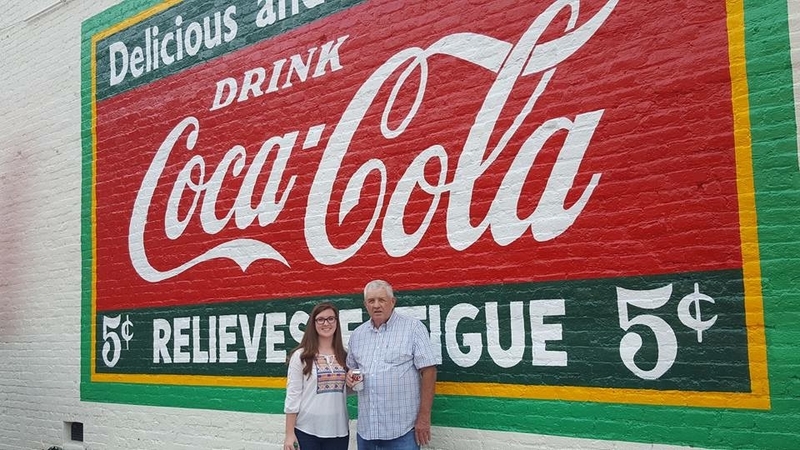 It was the first time she had visited the restored sign since she painted it with her grandfather, the late Andy Thompson, who was known throughout the state and beyond as “the Coke sign painter,” and known to Amber, 23, simply as Pawpaw. Andy and Amber spent a handful of hot days in August a few years ago restoring this “ghost sign” in the small town 38 miles west of Charlotte where Amber barrel-raced in rodeos as a child. Running through her mind were the memories — how hot it was, how she practiced lettering in Pawpaw’s backyard workshop in preparation for a project just like this, the fact that her grandfather wouldn’t let her paint the top section of the sign, 20 or more feet off the ground. Her reverie bought back the exchange: “Pawpaw, you’re 76 years old. Maybe I should climb the ladder.” His protective instincts prevailed as he went up the ladder himself. Cherryville wasn’t the first collaboration between Amber and her grandfather. The two worked on a sign in Concord, North Carolina, where two brick walls became powerful symbols of a city’s revival. These murals are called “ghost” signs — covered in shadows for years, reappearing like ghosts, weathered, faded and barely discernible. The signs reflect the era in which they were originally produced, times when Main Street was where everyone shopped and the circus still came to town. Why bother resurrecting weathered, old advertising signs? For Coca-Cola Consolidated, the answer is uniquely personal. The company has always built close relationships with the communities it serves. By restoring more than 33 signs around the South, the company stays connected to that history, giving memories back to those who were younger when the signs were fresher and building new memories with each renewal. It’s ironic that one of the Concord signs Amber and Andy repainted uses a Coca-Cola slogan of its day: “Relieves Fatigue.” For other downtowns in the South, the restorations helped do just that. In 1972, the advent of the Concord Mall was attracting store after store away from downtown. If there was hope for the downtown’s future, it was well hidden. But something else was hidden, and years later it helped galvanize the town’s revival. Fast forward to February 2011. The owner of a building at Cabarrus and Union streets decided to remove the decades-old aluminum siding from his building. As the panels were peeled off, what appeared underneath was a remnant of an old Coca-Cola sign painted on the bricks. The old mural featured a smiling woman holding a bottle of Coca-Cola, with the message, “Things go better with Coke.” The image was faded and hard to make out, just a “ghost” of the colorful 1960 original. The discovery created a feeling of excitement in the town, and many remembered the sign in its glory. It became a community rallying cry to bring the sign back, and as with so many small-town questions, people turned to the mayor for answers. Mayor Padgett contacted Lauren Steele, then senior vice president of Coca-Cola Bottling Co. Consolidated in nearby Charlotte. Both men agreed that restoring the sign would give the town a lift. Enter Andy Thompson, a sign painter at Coke Consolidated for 34 years before his retirement in 1987. Because a restoration project doesn’t involve the paperwork and bureaucratic hurdles of a new sign, Andy could get started as soon as weather permitted. Amber recalls that people would come by daily to watch the progress as Andy filled in the original outlines to recreate what would become a local landmark. “It must have been like watching history be reborn,” she says. Soon, wedding parties would show up to have their pictures taken in front of the smiling Coke lady. Prom night brought out students in formal dress. Anniversaries, birthdays, and more than a few family reunions attracted people to a reviving downtown. In days past, murals painted on city buildings and rural barns were a common form of advertising. They were everywhere. So, too, was Coca-Cola — at soda fountains, in red vending machines in public places, filling icy buckets at church suppers and family picnics. Because Coca-Cola — the company and its products — are born of the South, it’s especially fitting that the revival of a Southern city was helped in no small part by a nostalgic recollection of Coke and the past. In 2016 a second “ghost” sign was uncovered a few blocks down Union Street near the courthouse. Andy invited Amber to work with him on this restoration. Then an art student at Winthrop University, Amber seized the opportunity to learn on the job. Her grandparents — Andy and Hilda — had been teaching Amber and her two sisters crafts and drawing all their lives, so Amber was as able as she was willing. “Amber is definitely an offspring of Andy,” Hilda says of her granddaughter. Restoring a two-story mural on a brick wall is not the same thing as sketching on a drawing pad. Amber had to learn the intricacies of sign painting on a large scale. So how does an artist take a 12-inch drawing of a soda bottle and accurately recreate it 12 feet high on an outdoor brick wall? When it’s an iconic Coca-Cola bottle, familiar to everyone around the globe, the drawing must be done perfectly. No approximations allowed. Amber learned many tricks of the trade from her grandfather, including the best way to create a full-scale print of the bottle: Project the image onto a studio wall and trace the outlines. Next you lay that tracing down on the studio floor and use a “pounce wheel,” a sort of X-ACTO knife attached to a pinwheel, to punch tiny holes along the lines on the tracing. The pattern can then be mounted in place on the wall to be painted. Amber likens this technique to the paint-by-number sets she did as child, where the outlines are first established for the artist to later fill in the colors, only in this case, it is the artist who creates the outlines herself with the chalk dots. A typical mural might require several patterns for objects like the bottle or images of people in the mural. “No matter how large the mural, a skilled and patient artist can reproduce the original design with uncanny accuracy,” Amber says. Restorations present different challenges. In many cases a mural is badly faded. What’s left is a mere “ghost” image of the original. Behind the Thompson home in the Steele Creek neighborhood of Charlotte is Hilda’s art studio, built for her by her husband Andy. Before her grandchildren filled her days, Hilda led art classes here. Now, the studio holds pictures and memorabilia from Andy’s nearly 60 years of work. Over the years he painted, first for Coca-Cola then on his own, banners, storefronts, church signs, water tanks, gym floors, billboards, political signs, outfield walls and scoreboards in ballparks, murals on exterior walls on downtown buildings, and lettering on fire trucks. He even painted a Coca-Cola sign on a roof in Tuxedo, North Carolina. A “car guy” his whole life, Andy painted race cars for legendary drivers like Buddy Baker, Bobby Allison, and Richard Petty. He also painted signs at the tracks where they raced. He loved to go to the races, finding joy just hanging out in the pits. One time he took Hilda, who says she didn’t share his passion for noise and gasoline fumes. She asked him, “Please, don’t make me do that again.” There’s no record of Hilda ever returning to a NASCAR track. Behind the studio is Andy’s workshop, where Amber spent time learning the sign-painting craft from her grandfather. To get there, Amber guides visitors through a cow pasture that’s part of the family farm. “Watch your step,” she says. On a farm with more than a dozen beef cattle, a word to the wise is sufficient. Indeed, it is. The place is crammed with the accumulation of decades: Paint cans older than Amber herself, tools of every description and some that can’t be described, a ’66 Chevy in various stages of restoration, silkscreens, bottle openers, buttons, and signs, signs, and more signs. “It’s never been swept out, never organized,” Amber says with a smile. The workshop was where Andy trained Amber in his craft. “He had a theory: If you can do the letters ‘i’ and ‘o,’ you can do the entire alphabet,” she says. The practice panels leaning against a wall show the results of Amber’s two-letter tutorials and her progress through the rest of the alphabet. And he never did anything else. On a Friday night in 1958, Andy graduated from Charlotte’s West Mecklenburg High School. On the following Monday morning he started his first full-time job at Coca-Cola. He never had to look for another one. In Hilda’s studio, Amber flips through the essential guide for a Coca-Cola sign painter: “Designs for Painted Walls and Building,” prepared decades ago by the advertising department of Coca-Cola. The well-worn book held together by tape shows in great detail the exact proportions of various elements used in advertising, enabling an artist to accurately reproduce everything from the bottle to the style and proportions of the lettering in “Things Go Better with Coke.” Everything an artist needs to know about making an accurate reproduction is in the book, from paint formulas to typeface design. It even includes drawings of the people to put in the ads — a handsome Clark Gable look-alike, the dark-haired woman used in the Concord mural Amber helped restore, even the Sprite Man — all predesigned for replication in ads and signs. This book became an integral part of Amber’s education, learning she put to use first in Concord. Working with her grandfather, Amber soon learned restorations were more than painting exercises. The work was itself a street performance as people stopped by to watch and ask questions as they followed the progress. Today, Amber’s education continues with stories shared by her grandmother about her grandfather’s work. There’s the Sunday morning he was painting a mural near a church, his attire appropriate for the job. Working with gallons of paint, you don’t wear a three-piece suit. A father and his young daughter stopped to watch on their way home from church. His paint-spattered clothes hardly matched their Sunday-best. After observing the scene for a few moments, the child was moved by the spirit of charity. Andy smiled and continued working. Finding those signs is the job of Christi McGee, senior director of community advocacy for Coca-Cola Consolidated. “We want to identify signs in smaller towns. We also want to find opportunities in urban markets, where reviving central cities are enhanced by the work of local artists.” Coca-Cola Consolidated is also exploring restorations of classic neon signs, and new murals are also in the works. In Terre Haute, Indiana, home of Root Glassworks, which designed Coca-Cola’s original contour bottle, preparations are being made for a 52-by-142-foot downtown mural, the largest in Coca-Cola Consolidated’s history. Amber herself continues in the traditions of her grandfather with projects for Coca-Cola Consolidated that include painting designs on a coffee table and a mural in the Charlotte headquarters as well as a big deck table at the Customer Care Center.